the age of a shelf (shows the repartition of the age of the last sell for every book). Answers the questions: this how long did I sell a book of this shelf ? Is this shelf dynamic, have I been selling more books of it in the last three months than in the last year ? 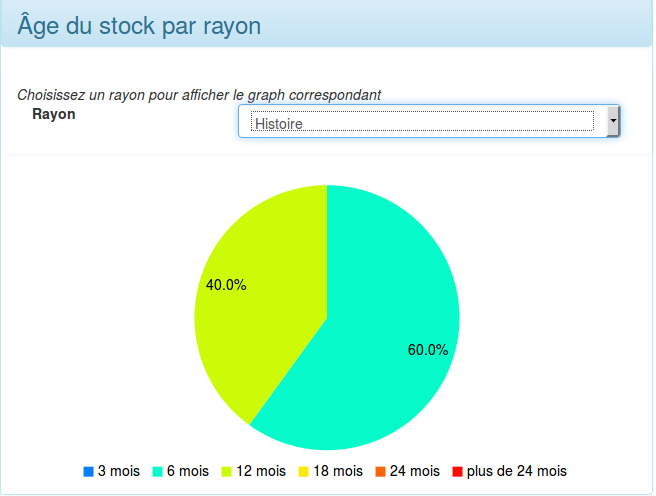 stock's "cleanliness": pourcent of titles with no copy, with only one or more. In the History page, we can also see the total number of sells for a given month and a given supplier, alongside the total revenue, the sell mean and the best seels. Stats are still in development. Your feedback is welcome. What do you need ?